Eagle Nest Golf Course is located just north of Myrtle Beach in Little River, South Carolina. This iconic Gene Hamm designed course is a main attraction for golf loving tourists from across the country. The course recently underwent renovations in order to provide options that are more challenging for avid golfers while retaining the simplicity that beginners and average golfers enjoy. This 18-hole course boasts significant all natural beauty unlike any other. During the first 15 holes, golfers are introduced to the increased challenge provided by the final three. The final three holes on this course have been deemed, "The Toughest 3 Finishing Holes on the Grand Strand." Golfers enjoy frequenting Eagle Nest Golf Club throughout the year because of perfect year-round golfing weather. Since this course is situated so close to Myrtle Beach and is easily accessed by highways, many tourists and Myrtle Beach residents enjoy making the drive to enjoy a few hours of fun-filled challenges and leisurely golf activities. 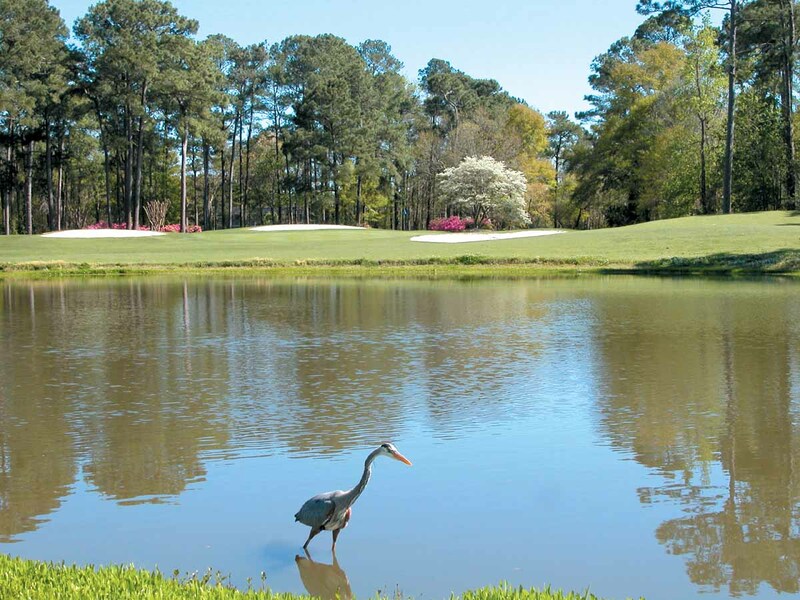 Individuals and their families enjoy visiting the park and soaking in the picturesque setting of towering pines, frequently seen wildlife inhabitants, and the scenic one-mile entrance drive into the course. Springtime provides an abundance of color with beautiful blooms of wisteria, dogwood, and azaleas. Eagle Nest Golf Course is one of the more relaxing course settings of all the courses in the Myrtle Beach area. Wetlands, lakes, and bunkers provide plenty of challenges for seasoned golfers. In fact, Hamm's design inspires golfers to reach for almost every club they have in their set. Therefore, golfers must plan their approach to the fairway and then onto the velvety smooth green carefully. Eagle Nest Golf Course is located just north of Myrtle Beach in Little River, South Carolina.